Being atheistic defines what a person does not believe, but it may not sufficiently describe what one does. This is one of the central sticking points for atheists who hope to make their voices heard in American politics: deciding what those voices should be saying, and then, how best to say it. For some nonbelieving Americans, the goal is simply to be left alone, free to refrain from worshiping any gods, and have religious Americans keep their supernaturalistic beliefs out of government. For others, there is a feeling that nonbelievers have been champing at the political bit for too long. 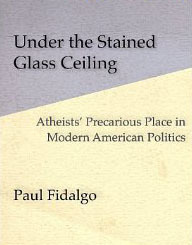 This book will explore atheists’ precarious place in American politics, both in terms of their potential for impact and the harsh realities of their station in American society. We will examine the oft-conflicting goals of the nonbelief movement and take a critical look at the dominant strategies for achieving those goals. And in the light of their failures and successes, their public image and their political potency, we will evaluate the prospects for atheism in electoral contests and for mainstream social acceptance. Feeling a renewed sense of purpose, and sensing a rare opportunity, atheist Americans are preparing to mark their territory in the political arena. As has always been the case, however, there is little consensus as to what victory looks like.